We estimated the DNA copy numbers of the 2011 German outbreak strain E. coli O104:H4 (TY-2482 and LB226692 from BGI ftp://ftp.genomics.org.cn/pub/Ecoli_TY-2482/) on Ion Torrent sequencing data. The O104:H4 copy numbers are given in relation to the copy numbers of the E. coli strain K12 DH10B (from http://www.edgebio.com/services/iontorrent.php, download instructions at the bottom). 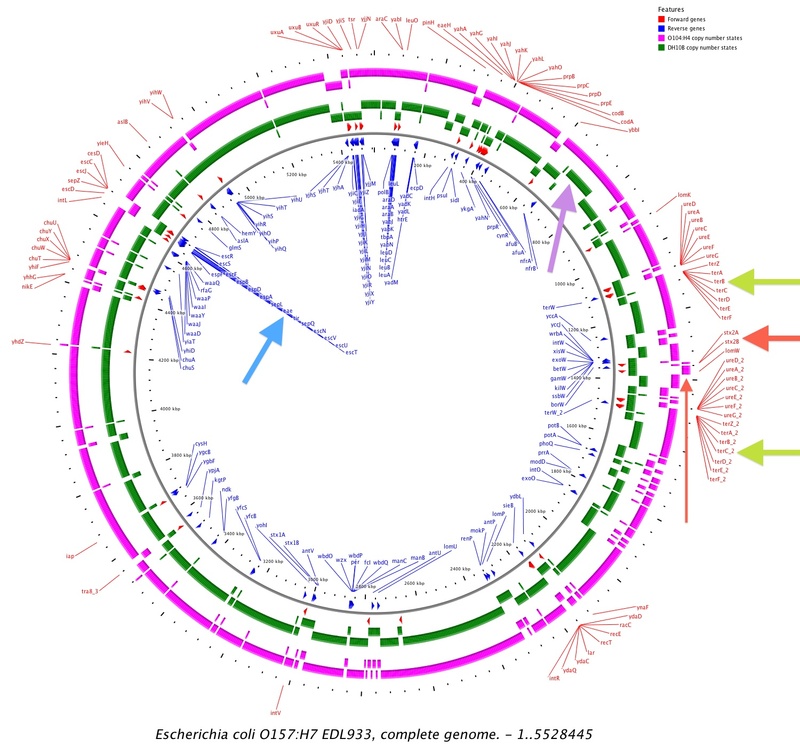 As reference genomes, to which the sequencing reads are mapped, we used E. coli strains DH10B, 55989, and O157:H7. Including the sequencing data from K12 strain in our analysis allowed us to separate technical / biological variations from true copy numbers. For copy number estimation, we used our probabilistic model cn.MOPS (http://www.bioinf.jku.at/software/cnmops/cnmops.html) which has been designed for estimating copy numbers in next generation sequencing data. cn.MOPS decomposes read count variations into variation caused by DNA copy numbers and random/noisy variations. Figure 1. Copy numbers variable regions of O104:H4 compared to DH10B if mapped to O157:H7. Red arrows: shiga toxin stx2 is amplified in O104:H4; Green arrows: tellurite gene cluster ter are present in O104:H4; Light blue arrow: intimin gene eae is missing in O104:H4. Violet arrow: copy number 2 region from 675kbp to 770kbp detected in DH10B. Figure as SVG. The shiga toxin stx2 is characteristic for O104:H4 as a manuscript of the "Bundesinstitut für Risikobewertung" states (http://www.bfr.bund.de/cm/349/enterohaemorrhagic_escherichia_coli_o104_h4.pdf). Our finding that tellurium resistance genes are present in O104:H4 has also been reported in NatureNews (http://www.nature.com/news/2011/110602/full/news.2011.345.html) at June 2nd by Marian Turner who writes “In addition to the antibiotic-resistance genes, the bacteria contain a gene for resistance to the mineral tellurite (tellurium dioxide)”. In the same article Marian Turner writes “One telltale sign is that the strain does not contain the eae gene, which codes for a protein called intimin, an adhesion protein that allows the bacteria to attach to cells in the gut” which we also confirmed. Our findings concerning β-lactamases are of interest as they tend to make bacteria resistant to common antibiotics. Manuscript in Nature precedings “Escherichia coli EHEC Germany outbreak preliminary functional annotation using BG7 system”, Marina Manrique, Pablo Pareja-Tobes, Eduardo Pareja-Tobes, Eduardo Pareja, and Raquel Tobes (http://precedings.nature.com/documents/6001/version/1).